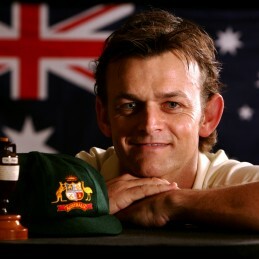 Adam Gilchrist was perhaps the most entertaining player that world cricket has ever seen. He joined the ranks of interactional cricket as a wicketkeeper-batsman in the Australian One-Day International side in 1996. In 1998 then captain Steve Waugh promoted Adam to open the batting, a move that would pay immediate dividends as he scored 100 in that match and would redefine the role of an opening batsmen. An incredible and essential contributor to the 1999, 2003 and 2007 World Cup championship teams, Adam’s 149 in the 2007 World Cup Final against Sri Lanka in Barbados led to Australia’s third consecutive title. Adam took 472 dismissals in one-day internationals and scored of 9,600 runs at a strike rate of almost 97 runs per 100 deliveries. In November 1999, Adam was a controversial replacement for wicketkeeper Ian Healy in the Australian Test team. He would go on to take 416 dismissals in 96 matches, score 5570 runs, including 17 centuries, at an average of just under 50 with a strike rate of 82. On a sunny Perth December day in 2007, Adam made a mockery of an England attack scoring the fastest Ashes century and the second fastest century of all time in just 57 deliveries. Later that year Adam would become the first player to hit 100 test sixes in a career. Adam reached 100, 200 and 300 dismissals faster than any other wicket keeper in history. Known for his incredible leadership, Adam is the only Australian wicketkeeper to captain the Australian Test and One-Day teams. In 2004, standing in for an injured Ricky Ponting, Adam led the Australian team to its historic first test series win in India for 35 years. Although he is perhaps the best wicketkeeper-batsman to have played the game, Adam was known for the spirit in which he played the game. In 2004, cricket legend Ritchie Benaud selected Adam in his all-time greatest test team alongside Sir Donald Bradman, Dennis Lillee and Shane Warne. On Australia Day 2008, after breaking the record for the most number of dismissals by a wicket keeper (415), Adam retired from international cricket. Adam went on to captain the Deccan Chargers to a championship in the 2009 Indian Premier League, also being named player of the tournament. Adam was awarded an AM in 2010 for his contribution to cricket and services to charities in the community.